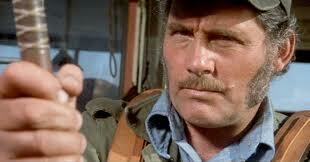 If you have seen this clip before, than you already know the power of Robert Shaw as an actor in the perfect role. I am sure you have heard it said in a dozen other places, but when the history of acting awards is written, this will be the biggest glaring omission ever. This four minute scene is sufficient in itself to have impressed anyone who cares about film acting. It is the go to piece from this film. I have nothing but respect for everyone involved in putting this piece of cinematic art on the big screen for us to enjoy, chew on, and be horrified by. There are however a number of other reasons that this is the ultimate Robert Shaw film role. Let me start by pointing out that in the first hour of the movie, Shaw's character Quint can be seen only twice. One of those is a passing shot as he looks derisively at the weekend warriors who have shown up to try and catch the shark that Mrs. Kitner has put a bounty on. This comes a few moments after his earlier scene and reminds us of the earnest, self righteous, and totally commanding presence his character promises to be. We are left to wait until half the movie is over to see him again and have that promise fulfilled. The shipboard scene in the harbor lasts a few seconds. The two minutes he gets as an introduction came just before this and sets up our tension as much as the shark attacks do. Many characters have been given incredible entrances into the stories they are a part of. Omar Sharif appears as a speck against a desert horizon, coming closer and dominating the scene by the time he arrives. Hannibal Lecter is the bogeyman we are warned about and frightened of before we ever see him, but when he is revealed, standing in the middle of a dungeon like cell, with a polite manner and chilling smile, the creep factor is on ten. Darth Vader, strides into the original Star Wars through a cloud of white steam, emerging as a figure of doom clad in black with a voice like a mechanical god. Quint though may take the cake. We know he is there from the terrifying squeal of fingernails dragging across a chalkboard. This may be an experience younger viewers will be unfamiliar with, but anyone who went to school in the 20th Century will know how awful that sound is and will find their own fingers twitching and teeth grimacing as he does what most of us would refrain from doing even if we were being paid. It does the trick though. Quint takes the focus of the town meeting away from the mayor, the police chief, and all the prominent local merchants, and he seizes the moment to make his pitch to the assembled community. He is an Islander, and he does not fit in. He is rough, blunt and cheerily superior in his world to anybody there. Shaw uses a charming grin, to deliver his bitter advice and then makes his exit quickly, like any well trained speaker ought to do. We know another force of nature besides the shark lurks in the waters around Amity, and he will not speak to us again for forty more minutes. Shaw has three repeating tricks to draw on with this character that he takes full advantage of. In addition to all the best lines and the most interesting character, Shaw gets to punctuate Quint's impact with song on at least three occasions. As he mocks Hooper's technical tools, before they leave port, he engages in a sea shanty that refers to doomed fishermen. He sings it joyfully. It is an indicator of his comfort in his superiority in this scenario. Later, as a gesture of good will to traveling companions that may not be up to his standard but have put in a good days work and broken down some barriers, he sings with them, a well know sailing song, that sounds like the wish of every drunken fisherman. One last time he returns to sing the sea shanty, is when he thinks he has the upper hand on the shark and attempts to draw it into the shallows. It was his last moment of confidence in the film. The second trick the actor gets to use is all his own, it is unscripted and natural. He wears a hat like no one else can in this movie. Sometimes it is down over his eyes giving him a menacing continence, other times it is pushed back in a nearly jocular manner. The actor conveys superiority, dismissiveness and friendliness all with the same action, but when combined with the right tone of voice or facial expression, you will never be in doubt as to which one is being directed your way. The third trick is a tool that I have seen other actors use, but none so naturally as Shaw. He is nibbling on something or drinking something in nearly every scene. An apple slice, a toothpick, a piece of hard cracker, and a can of beer all tell us the characters inner mind. They say "I'm condescending to speak to you", or "I'm determined and focused", or simply, "I'm better than you". Spielberg is the ultimate actor's director so he probably had a hand in these choices, but Shaw is the man that has to sell them, and he does. Characters that are well written must be a joy for actors to play, but Shaw may not have had much joy because he apparently was sea sick for much of the shoot. You will not see a sequence in the film though where he does not look at home on the boat or a part of the sea. There were other actors considered for the part before he was given the role, and everyday we need to be thankful that they could just not work it out. 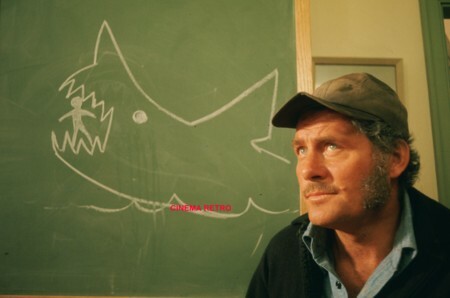 As a consequence of their inability to make room for themselves in Jaws, they made room for Robert Shaw in the eternity of great actors meshed with great parts. Compare Shaw in Jaws and From Russia With Love and you can see how amazing he was as an actor. Where Have The Theater Ushers Gone?